*WARNING* - These piping skills leave A LOT to be desired!! If one could interview when decorating cookies I would have added "steady hands need only apply". But in the end, you get the idea of where I'm going with this. Plus what can you expect for an up all night, toddler hanging on my pants at 3 am, 2 cans of soda kinda girl??? 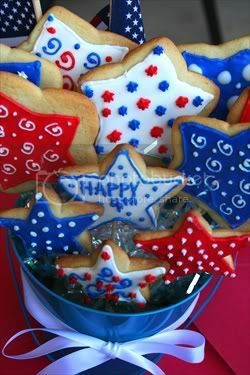 In my attempt to continue to find that "just right - WOW factor" item to take to the upcoming Fourth of July picnic scene, I introduce you to the frosted sugar cookie- Fourth of July style. I LOVE frosted sugar cookies and once you get the hang of it (which obviously I'm still learning to do) it really becomes quite fun. Just outline the cookie with butter cream icing first - recipe can be found in this post. Then use flood icing to fill in the rest of the cookie. (Pros: correct me if I'm wrong in my description, but flooding the cookie is like zig zagging the thinner icing over most of the cookies surface and then using a tooth pick or such to spread it around and fill in the gaps.) After the flood icing has begun to set up (and learn from my mistakes - don't have the central air vent blowing directly onto your cookie while working with the flood icing as it will begin to set FAST! ), decorate with your choice of icing or frosting, and let your imagination take over from here! Allow icing to set - at least 4-6 hours or overnight I find is best (nothing worse then trying to arrange them and having them start to drip down the cookie before your very eyes - so sad). 1/2 tsp almond extract - I didn't use this because Will is allergic to nuts and I wasn't sure if this would kill him or not. In large bowl, beat powdered sugar and butter on low speed or with spoon until light and fluffy. Stir in vanilla, almond extract and egg. Stir in flour and baking soda. Cover and refrigerate at least 2 hours. Divide dough in half. Roll each half 1/4 inch thick on lightly floured surface. Cut into desired shapes. 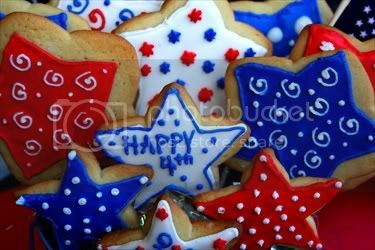 If cookies will not be frosted, sprinkle with sugar, sprinkles or decorations of your choice. On ungreased cookie sheet, place cutouts 2 inches apart. Bake 7 to 8 minutes or until edges are light brown. Immediately remove from cookie sheet to cooling rack. * I found that I needed to add a bit more water. A good judge in testing the flood icing is to place it on a suface - I use a plate, and drag a spoon through it to create a line, a good flow icing consistency should fill back in by the time you count to 10, anything faster or slower needs to be adjusted by adding more water or sugar until desired consistency is reached. Tune in tomorrow for info about my first giveaway!!!! I think you did wonderful! I can feel your pain with all of those decorations. I too have had my run in with decorated sugar cookies! Those look like something out of a magazine. They look too yummy. Nicely done!! Your piping skills are great! Trust me I have produced much sloppier looking iced cookies. Awwwww, you guys are too sweet! Thanks so much for the kind words and confidence booster where piping skills are concerned!!! Wow! These turned out beautifully! I know how hard it can be to decorate cookies like this, so I am very impressed! Great job! Adorable, adorable! I think they look like something out of a magazine, too! Love your festive cookie pops. These look and sound YUMMY!!! I love sugar cookies - making them and sugar cookie crafts! Take a spin over to my place - I am in the process of posting a series about sugar cookies - crafts, shaping food, etc.!!! I love for u to take a look see and tell me what u think!